What is Bloomberg Tax Fixed Assets? Bloomberg Tax Fixed Assets is a powerful fixed asset management software solution which simplifies the complex tax and accounting processes associated with fixed assets. The solution is developed by Bloomberg Tax Technology also known as Bloomberg BNA, a software company which is offering an expert suite of tax and accounting solutions to help corporations and teams perform accurate analysis of financial and tax data, integrate their workflows, attain compliance, facilitate strategic decision-making, and increase profitability. Bloomberg Tax Fixed Assets automates the entire fixed asset lifecycle management process by allowing users to easily consolidate fixed asset data and automatically conduct calculations. The software solution also permits them to enforce GAAP-based policies, federal tax regulations, and controls so they can produce accurate data and reports. To enable users to obtain precision, Bloomberg Tax Fix Assets is built with wizards which have the capability to pinpoint data entry errors as users input new fixed assets. It also has a functionality which lets them apply the right tax codes and accounting rules. The fixed asset management software solution provides asset inventory features such as the ability to check existing fixed assets against financial data, write off ghost assets, and identify and classify assets and their conditions precisely. Bloomberg delivers integrated capabilities that streamline how users share fixed asset and tax data with their colleagues from other departments or divisions. Last but not least, it has optional add-on modules that facilitate the execution of routinary tasks, make it possible to generate reports in multiple currencies, assist in controlling Construction In Progress (CIP) fixed assets, and give Microsoft Excel fixed data analysis and reporting features. One of the powerful features offered by Bloomberg Tax Fixed Assets is that it helps users achieve precision as they perform tax and accounting works related to their fixed assets. Thus, it allows them to reduce data entry errors, do the right calculations, and identify discrepancies immediately. With Bloomberg Tax Fixed Assets, teams no longer have to deal with complex calculations, as the solution ca handle those through the aid of its automatic calculation capability. It can instantly calculate gain and loss, investment tax credit, bonus depreciation, disposals, and more. The solution also permits them to apply the right tax codes and accounting rules and validate them so they can come up with depreciation results that are accurate and standardized. When changes are made to existing federal and state tax laws and regulations, the solution will instantly update the changes within its system. Bloomberg Tax Fixed Assets ensures accuracy by letting users implement strong controls on their fixed asset and tax data. For instance, it can keep a record of all changes made to fixed asset and tax data, providing a complete audit trail where they can easily identify what changes have been made, who are responsible for those changes, and whether the changes made are valid and compliant. In addition, the solution unifies all deprecation policies in a central location wherein users can enforce built-in variations in depreciation methods and approaches which include multiple tables and formulas, depreciation rates, averaging conventions, and property types. Also, the enforcement of controls is enhanced by its integration capabilities, enabling them to integrate the solution with their existing ERP, accounting, and compliance management systems. As a result, tax and accounting regulations and policies, and fixed asset and tax data are standardized across the departments, divisions, and teams within the organization. Bloomberg Tax Fixed Assets allows teams to conduct a complete inventory of their fixed assets while they are acquiring or receiving assets and disposing or retiring them. As the conduct fixed asset inventories, they will be able to check their existing assets against whatever financial data they have. In case they detect ghost assets, the solution lets them remove those assets from their books so they won’t be incurring tax liabilities. 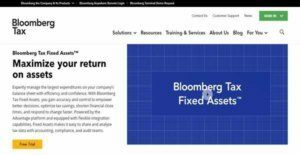 To reduce personal property taxes, Bloomberg Tax Fixed Assets enables users to immediately process the retirement of fixed assets that they are not using anymore. The fixed asset management solution automates tax and accounting works throughout the entire fixed asset lifecycle management. Users can gather data from the different companies, divisions, and locations involved and consolidate such data in one place. They can also generate and view reports on the consolidated data automatically. The solution comes with predefined reports such as RS Forms 3468, 4255, 4562, 4626, 4797, 8824, and Schedule M-1/M-3. If they want to generate their own custom reports, the solution supports that as well. Because the solution automates their tasks, they will be able to simplify complex processes and shorten financial close times. If you are considering Bloomberg Tax Fixed Assets it might also be beneficial to check out other subcategories of Best Fixed Asset Management Software collected in our base of SaaS software reviews. It's crucial to realize that hardly any service in the Fixed Asset Management Software category is going to be a perfect solution able to fulfill all the requirements of various business types, sizes and industries. It may be a good idea to read a few Bloomberg Tax Fixed Assets reviews first as specific services can perform well only in a really small group of applications or be designed with a very specific type of industry in mind. Others might function with a goal of being simple and intuitive and as a result lack advanced functionalities desired by more experienced users. You can also come across solutions that cater to a broad group of customers and give you a complex feature set, but that in most cases comes at a more significant price of such a solution. Ensure you're aware of your needs so that you purchase a software that has all the elements you search for. How Much Does Bloomberg Tax Fixed Assets Cost? Bloomberg Tax Fixed Assets’ SMB and enterprise pricing plan information is available only upon request. Please contact the sales department, and get your quote. We realize that when you make a decision to buy Fixed Asset Management Software it’s important not only to see how experts evaluate it in their reviews, but also to find out if the real people and companies that buy it are actually satisfied with the product. That’s why we’ve created our behavior-based Customer Satisfaction Algorithm™ that gathers customer reviews, comments and Bloomberg Tax Fixed Assets reviews across a wide range of social media sites. The data is then presented in an easy to digest form showing how many people had positive and negative experience with Bloomberg Tax Fixed Assets. With that information at hand you should be equipped to make an informed buying decision that you won’t regret. What are Bloomberg Tax Fixed Assets pricing details? What integrations are available for Bloomberg Tax Fixed Assets? Bloomberg Tax Fixed Assets can seamlessly work with your existing accounting solutions, enterprise resource planning or ERP systems, and compliance management tools. If you need more information about Bloomberg Tax Fixed Assets or you simply have a question let us know what you need and we’ll forward your request directly to the vendor.